Last week, AHDB Pork established that the volume of pig meat that could relatively easily be shipped to China falls short of the supply gap likely to open up this year. This week, the organisation is discussing how Chinese consumption of pork and other meats may be affected as a result. 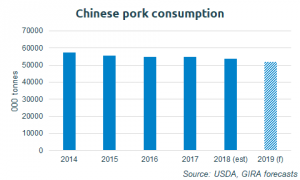 Beth Wilkins, a market intelligence analyst at AHDB, said: “It seems likely there will be less pork available for consumption on the Chinese market this year. Even if pig meat imports pick up by 50% compared to 2018, returning to around 3 million tonnes, a 5% fall in production would still leave a supply gap of around 1.5 million tonnes. Some reports suggest production could fall even more sharply. On top of this, reports suggest that urban consumers are already starting to avoid pork due to safety concerns. Ms Wilkins added: “African Swine Fever poses no real risk to human health, however Chinese consumers are particularly cautious about food safety due to a number of previous food scares. 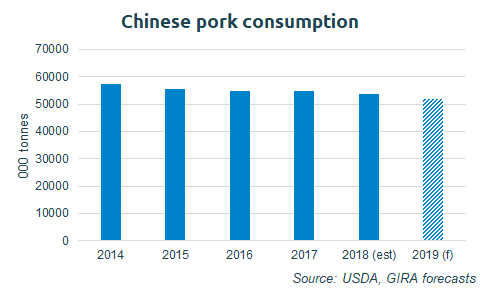 It is difficult to anticipate how much this might impact demand, but it’s likely this could limit the potential pork import opportunities China presents this year. There may be longer-term concerns too, with the risk that consumers might permanently turn away from pork to alternative proteins, stunting the potential for the market in the future.